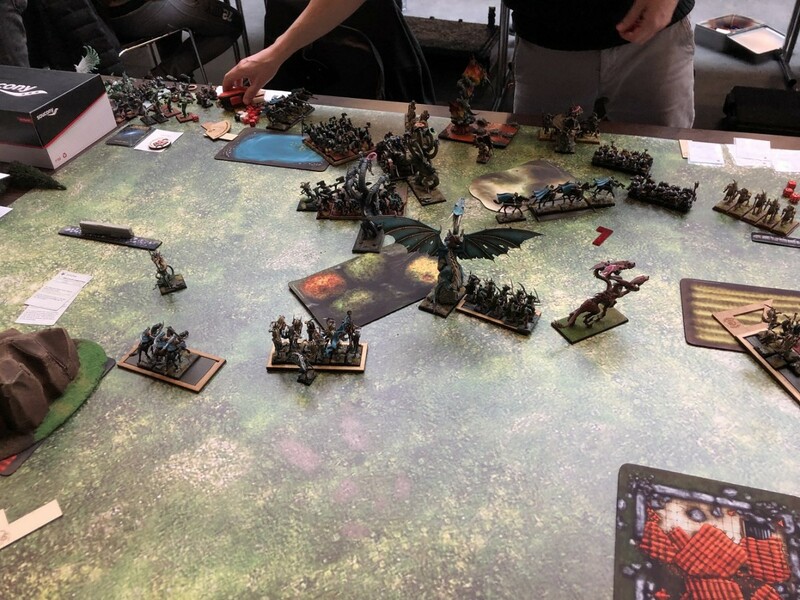 The past weekend I had the pleasure of attending one of the biggest and most well-runtournaments in the greaterregion, the Luxembourg Bash Masters. This was a 5-player, 5-game team tournament, run over an entire weekend, with 20 teams attending, for a total of 100 wargamers! Last year was the first time I made the 2,5h trip to Luxembourg for this event, and it was a great experience that you can read all about in this blog. Our team performed very well and we secured the first place, becoming the LBM champions! So returning to defend our title was something that we were looking forward to. And when I say “we” I mean my usual partners in miniature-related crime: @PrinceCharming and his Ogre Khans, @IHDarklord and his Undying Dynasties, @gregor and his Daemonic Legions, @Artur with his Highborn Elves and yours truly with my latest Dread Elf list. This year the opposition was of a very high level, as you can yourselves notice by the lists of the event (link). Between the teams we’d find two teams from the Netherlands, two German teams, two Italian teams, as well as some of the most well-known tournament players from France, arranged in three powerful teams. Belgium is always well represented due to the geographical proximity of Luxembourg, and this time we had no less than four teams! Add to that other French players, Team Norway,Team Switzerland and last but certainly not least Team Luxembourg and you have an amazing mix of players, gaming culture and ethnic diversity that guarantees a very enjoyable yet challenging weekend. First and foremost, I need to applaud the efforts of @kiri and his team of dedicated wargamers who organized this event. Every year it keeps getting better and better, with very good pre-tournament communication, a perfectly run event in itself with well-read and always available judges, top-notch bar/catering service and even a Saturday night social program that allowed us to chat a bit more with the other teams and also have a great time with our team mates. They always deliver great events, and they are the best guys to hang out with. One of the reasons why I am saying all that is because they are also one of the candidates for organizing the ETC 2020, and I think they would do an amazing job in running the event. So there, if you are one of the decision-makers about this, don’t hesitate a single minute to give them their vote! So a list combining high mobility, and featuring some of my favorite models/units in the entire Dread Elf line: the Medusae, the Blades of Nabh and the flying characters. Before the tournament, and in order to accelerate the play speed of the list, I had decided to drop all shooting from the list. This is an army that requires very good movement and is quite unforgiving when it comes to positioning errors, but is also very rewarding when it works as designed! You can find more discussion about lists in my army-building thread (link). Our first opponents were some of the top contenders for this year’s team France for ETC, team Obelix (AKA “les enfants du Sud”), bringing together some of the best players in France. I had previously had a great and very tactical game against @benj at last year’s ETC, so I was very happy that we’d be playing them in the first round. The pairing process pitted me against Vincent @vince3310 , and his Infernal Dwarves. 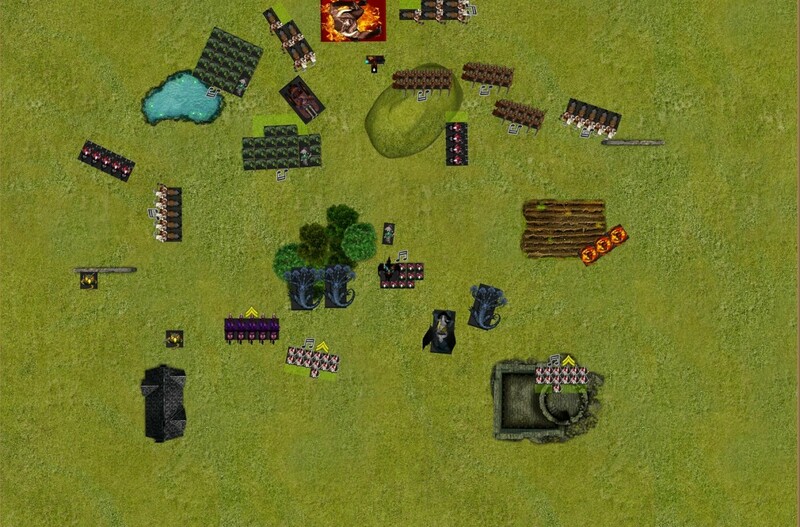 So in essence a pyro gunline with very good anti-push elements, good redirectors and resilient mobile scoring. The first round secondary objective was going to be Hold the Ground (predetermined and round-dependent) and we got randomly assigned a map-pack table designed for Counterthrust. My opponent picked the side of the table with a sizeable hill, giving me a big impassable terrain cutting off one flank of my deployment. We alternated the first few deployment drops and then I took the initiative and grabbed the first turn. My plan here was to limit enemy shooting/magic as much as possible by going straight for the caster’s bunker and the Infernal Engine. Advancing aggressively would also deny the ID maneuver space and would guarantee that they wouldn’t be able to get within 6” of the center of the table. 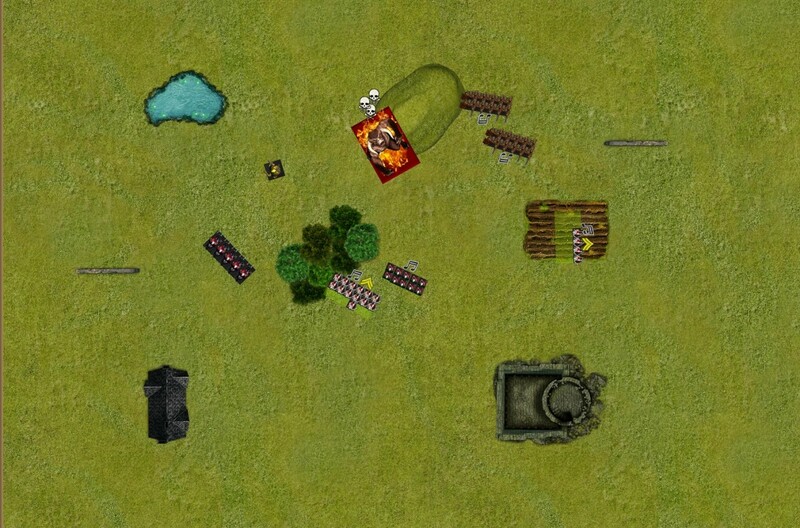 So I placed my Krakens right across the hill, with a forest terrain in between for added cover, placed my Medusae on the left flank in case my opponent tried to outflank me with his Kadim Titan and the vanguarding corsairs also near the middle so that the Pegasus Prince could reinforce either side of the table with his initial move. Vincent replied with a central deployment, keeping his forces tightly packed and in close support of one another, and the two Orc Slave units guarding his right flank. For spells, I selected Ice and Fire, Crippling Fatigue, Grave Calls and Breath of Corruption. The prophet chose Haze of Magnesia, Fireball, Pyroclastic Flow, Scorching Salvo and Flaming Swords. The Krakens advanced aggressively towards the enemy lines, with the Pegasus Prince/Corsairs in close support. I chose to keep the character inside the unit so as to minimize the damage potential of the Engine against him: 3+ aegis can only get you so far after all! The fast contingents moved up on both flanks, and to the right I set up a trap against the Kadim Incarnates: the Acolytes moved forward to force a frenzy check, and the rightmost kraken was ready to countercharge them when I fled with the acolytes. In magic I only managed to cast Ice and Fire on the Kadims, dealing a single wound. 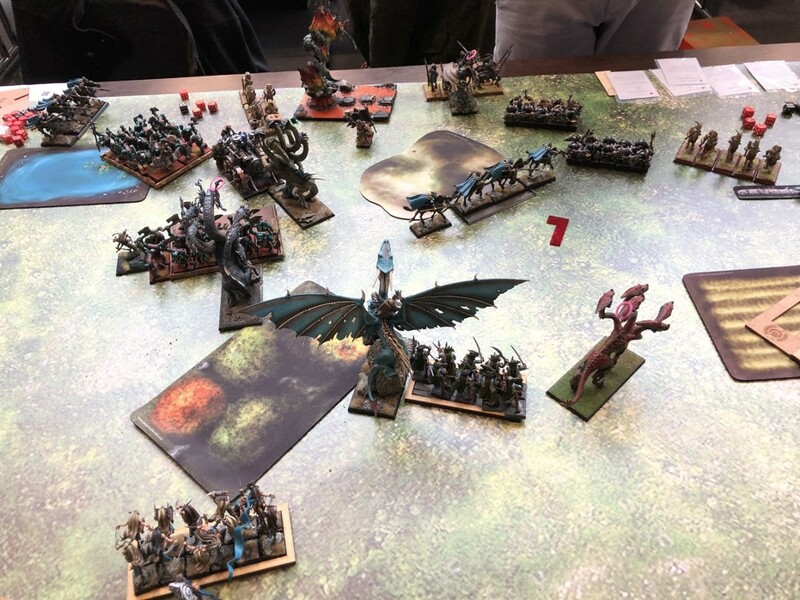 My opponent declared the charge against the Acolytes, and it was at that point that I noticed that my movement wasn’t optimal: I hadn’t checked whether the Kadims had line of sight to the Prince’s Corsairs, and it turned out that they did! So instead of risking a Kadim Incarnate charge against my prince turn 1 (they’d kill the entire Corsair unit and the prince would flee due to combat resolution) I elected to hold with the Acolytes. The Orcs charged into the Dark Raiders right in front of the engine, and the Titan passed his Frenzy check. Movement was conservative, the Titan moving back to avoid a charge from my Prince and the two dwarf characters wisely formed a unit of their own behind the hill. The Hobgoblin chieftain moved up to block the corsairs’ movement. In magic I let through the Haze of Magnesia on the leftmost kraken, then had to also let through the Flaming Swords on the Engine. 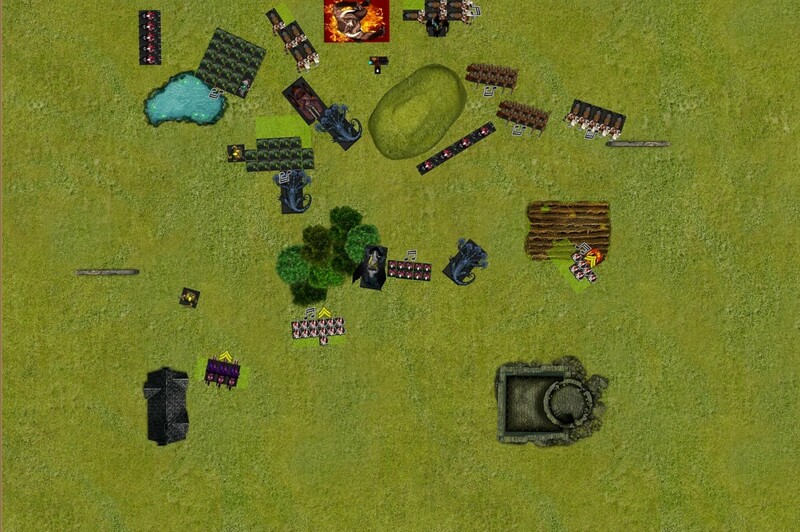 The 3d3+1 S4 hits from the Blaze/Magnesia on the hexed kraken only managed to deal a single wound. Another attribute on the Yema Acolytes sent them fleeing from panic. Shooting was also pretty uneventful, the accumulated penalties from Hard Target/Cover/range being enough to limit the damage to a single wound on the rightmost kraken. Combat was better for the ID: the Acolytes failed their Fear against the Kadim and only managed three unsaved wounds, and in return got slaughtered to an elf after some mediocre aegis rolling on my part. They elected to reform so as to exit the kraken’s line of sight, giving the Blades of Nabh an easy charge in the process. The Orcs killed one of my Dark Raiders, and the remaining four fled to safety while the orcs reformed. 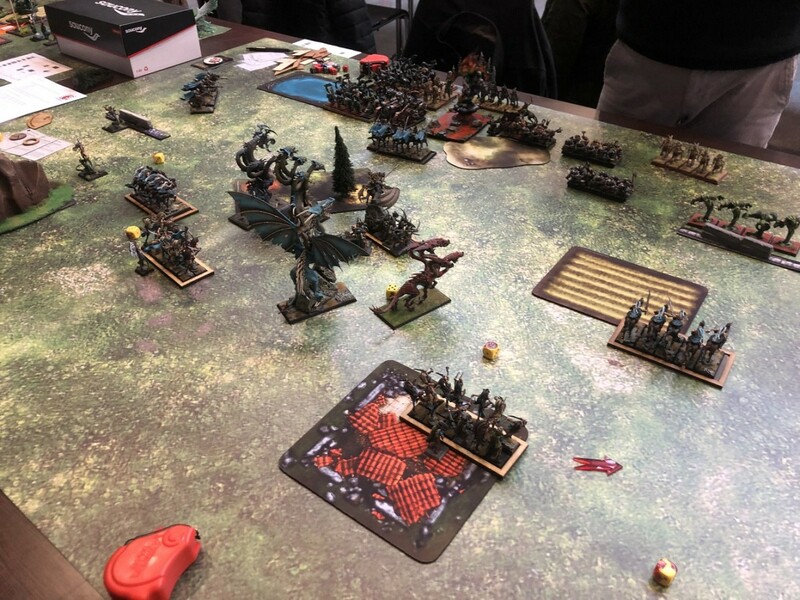 Not wishing to push their luck, the elves charged into the ID battleline: one kraken against the Infernal Engine, another against the victorious orcs, with the two medusae supporting in the flank (only one made it). The Prince charged into the closest Citadel Guard on the hill, certain that the Kadim wouldn’t be able to countercharge due to the Tauruk’s positioning. The Manticore Captain charged into the hobgoblin redirector and killed him, passing a couple of DT tests due to landing into the forest. Finally, the Blades of Nabh to the right charged into the Incarnates. 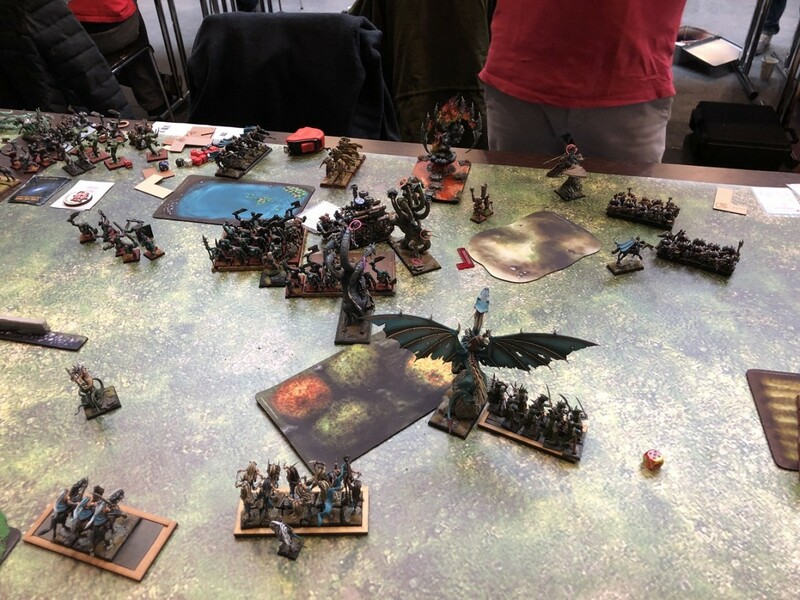 The fleeing dark raiders rallied, and reformed in a line to protect the prince’s flank from citadel guard charges on the following turn. With magic now seriously weakened, nothing of note happened. Combat started with the kraken and medusa killing a bunch of orcs, but the slaves held their groundthanks to the general’s proximity. The Kraken fighting the Engine was bolstered by the Beastmaster’s ability but still only managed 3 wounds on the ID warmachine, getting a couple of wounds back from grinds. 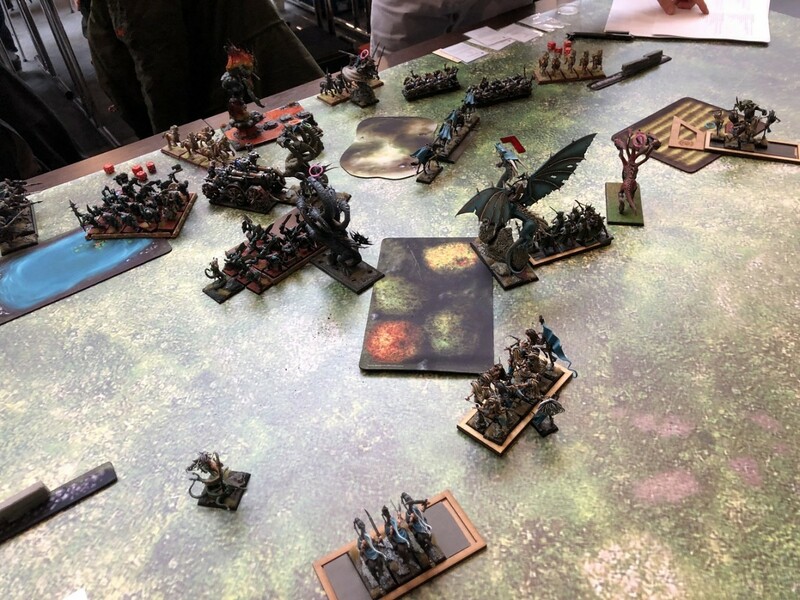 The Blades of Nabh performed quite well with their attacks, killing two kadims and only leaving the champion to reply: unfortunately, between his attacks and the volcanic embrace hits a total of 6 elves died, leading to a tied combat and exposing the Blades’ flank to the nearby Taurukh. The prince’s performance more than made up for it, though: he killed four citadel guard, taking a wound back from their attacks, but then the dwarven infantry failed their Ld9 rerollable test and fled, allowing me to pursue into the Taurukh unit hanging out right behind! 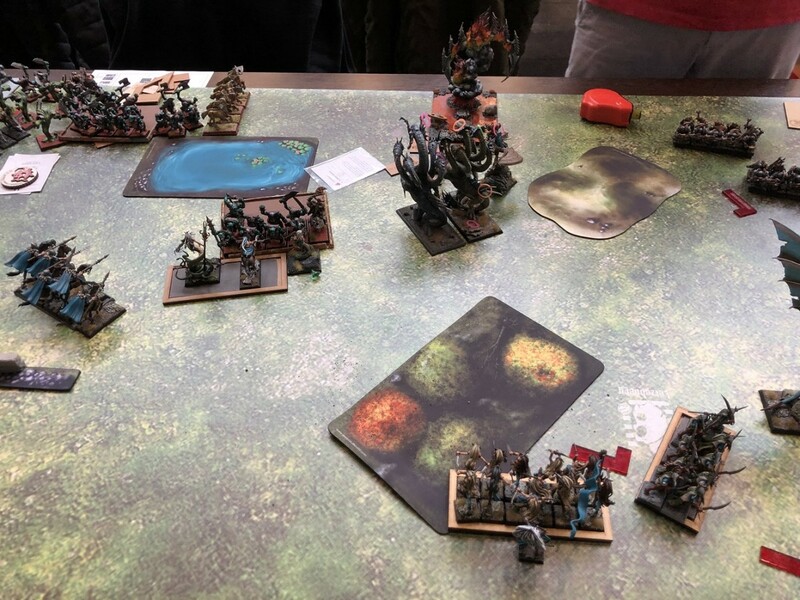 The rightmost Taurukh charged into the witch elves’ flank, and the second unit of Orc Slaves charged into the flank of the Medusa to bring ranks into the big fight. The previous turn’s events meant that my general would probably be free to charge whatever he desired on the following turn. My opponent promptly failed another Ld9 rerollable check to march with his two characters, meaning that they were left stranded in the middle of all the fighting, with no option of joining one of the remaining citadel guard units! In magic the targets were extremely limited due to lack of line of sight, meaning that all I had to dispel was the Scorching Salvo, letting the Flaming Swords go on the Infernal Engine. Shooting was aimed at the Dark Raiders, but only managed to kill three of the elven light cavalry, leaving a single survivor free to roam. In combat, the Prince killed four Taurukh and made the fifth run off the table, successfully restraining. The Blades of Nabh struck against the Incarnates before the flanking centaurs, and managed to kill the last survivor. 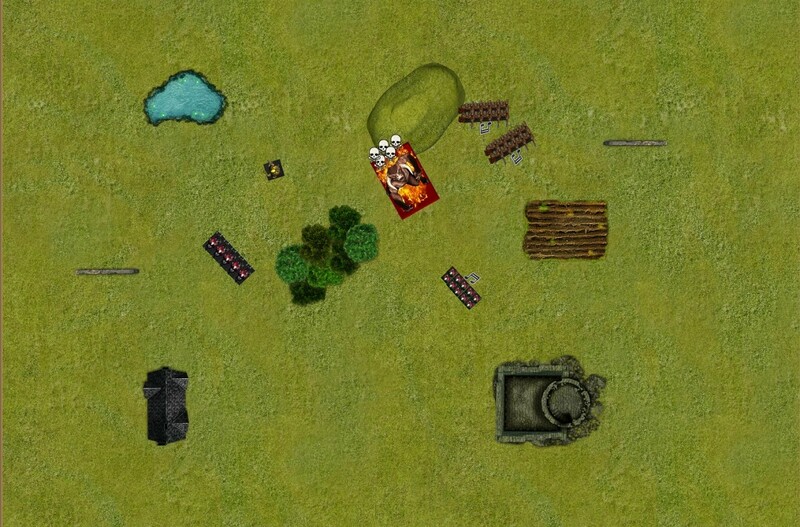 They got two casualties back, and fled due to combat resolution. The Taurukh restrained pursuit and turned to menace my scoring units holding the center. The Kraken fighting against the Infernal Engine got two wounds through this time, but I only got 1’s for the D3 multiplication, leaving the infernal machine still operating at 2w left! In return, the kraken was reduced to 1w remaining, and the Engine reformed to clear a path for the Kadim Titan. Finally, in the medusa/kraken/orc fight the DE came out on top, but were still a couple of casualties away from negating steadfast! The Dread Prince elected to charge into the BSB/Prophet unit; thanks to the positioning of my other units, it would have been impossible to flee to safety with them, so my adversary elected to hold. The second medusa and the yema acolytes charged into the front of the fresh orc unit in the multiple combat, hoping to tip the balance in my favor. The Manticore flew right in front of the victorious centaurs, so as to prevent themfrom charging my corsairs, and the lone dark raider stepped right in front of the Kadim Titan. The fleeing Blades of Nabh rallied. In combat the Prince got challenged by the Vizier, and predictably killed him in the duel. This forced the prophet to flee, and he was promptly cut down by my Lord. This, unfortunately, had the Prince end up right in front of the Kadim Titan, exposing his flank! 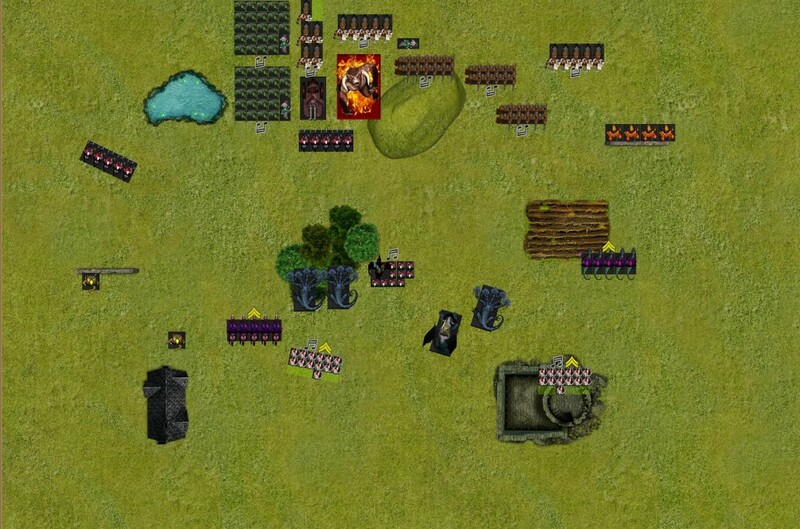 In the orc slave fight, the charging units were enough to tip the balance in my favor, forcing the depleted unit to flee. The kraken’s pursuit took it right into the Infernal Engine, and the combined attacks of the two monsters were enough to finally kill the warmachine. 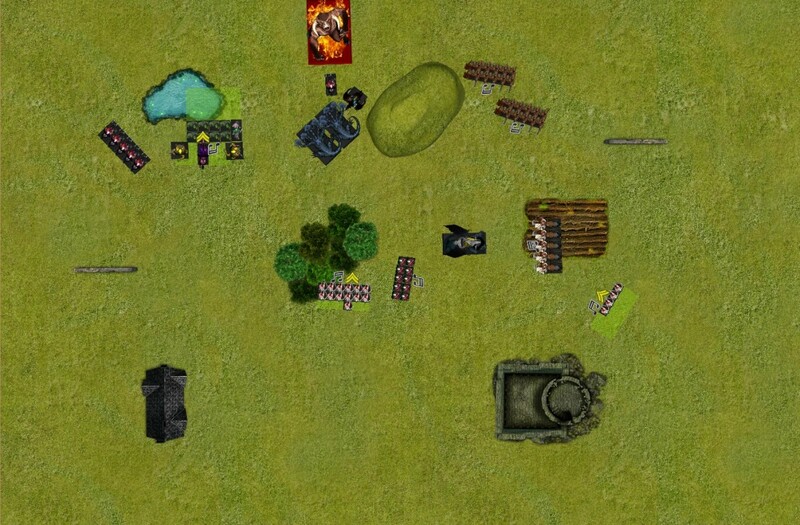 The ensuing panic tests caused the Taurukh unit in the backfield to flee off the table. My adversary went on the counterattack: the Kadim Titan charged the dark raider that I had placed right in front of him, and I opted to flee. That was a somewhat calculated risk since without a general and BSB the Kadim would have to pass a Discipline 8 check to redirect into my prince, as opposed to having a direct overrun into him. My opponent made his test, and the Titan fell into my Prince’s flank! The remaining Tauruk charged into my BSB on Manticore, and the closest unit of citadel guard attempted a long charge into his flank but failed. Shooting managed to finally kill the last Dark Raider. The Orcs in combat killed the paired weapon medusa, but suffered enough casualties back to make them flee, getting cut down by my yema acolyte in pursuit. The taurukh caused a wound to the Manticore for no wounds back, but my BSB held his ground. Finally, the Kadim Titan got a couple of wounds from the Prince, and didn’t manage to punch through my 3++ aegis save vs flaming attacks. Still losing combat due to the flank charge, I had to pass a discipline 7 rerollable test and fortunately made it, pinning the kadim in place. On the flipside, the Prince failed to reform, still leaving him in a precarious position. 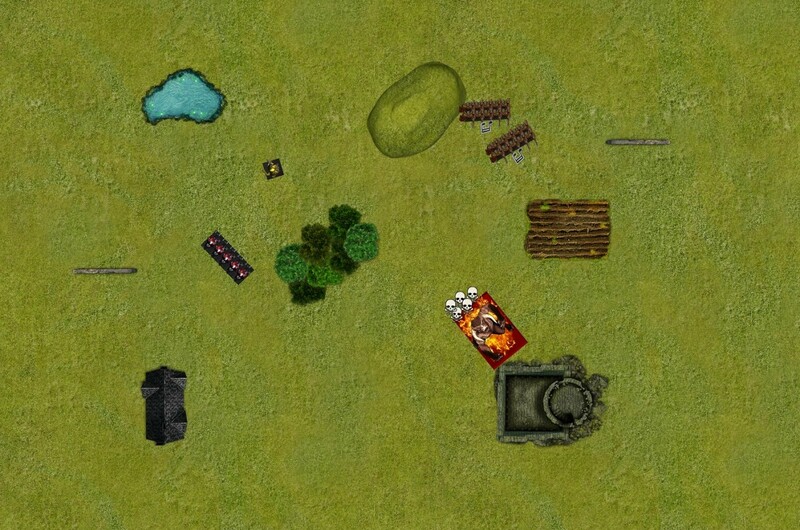 So by now the Hold the Ground objective was all but won by the Dread Elves, and I was way up in points. The only hiccup was to deal with the Titan and get my Prince out of the bad position he was in, so the kraken duo flanked the Kadim. The rallied Blades rear charged into the centaurs in combat with my BSB, what remained of the army relocated towards the center. In the magic phase I tried to get the Deceptive Glamour bound spell off on the Kadim Titan but my opponent wisely dispelled it. I did manage to give a toxic breathweapon to my Prince though. Combat started with the Blades of Nabh forcing the Taurukh to flee, freeing up the Manticore for some turn 5 charges. The Kadim Titan fight started off with the Prince only dealing a single wound with his Breath Weapon and his attacks, then my opponent got to strike before the charging krakens: after a bit of deliberation, he elected to split his attacks, striking twice against the nearly dead kraken and four times against the kraken that had 3 wounds left. Despite only hitting on a 4+, after Battle focus kicked in he managed 2 and 4 wounds respectively on my krakens, instantly killing both! That was too much for the general, who fled and was cut down in pursuit! The kadim titan charged into the lone dark raider, killed him and pushed forward towards my units holding the center. The citadel guard turned to face the Manticore, and let loose: 20 shots later, the manticore lay dead, denying me of a yet another tool to deal with the Kadim! So in a matter of a single turn, I had lost 2500 points! 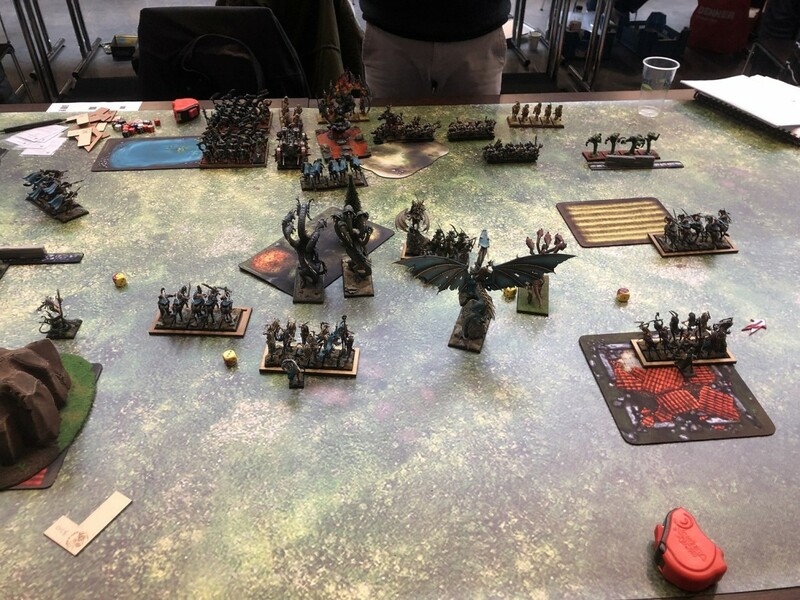 This meant that the game had gone from a big win to a draw: the Kadim Titan had to die, so the Corsairs declared a long charge against the citadel guard so as to free up the path for the Blades to charge into the titan, now on 3 wounds remaining. Magic was of little consequence, and in combat the bad luck continued: 25 attacks with Hatred and poison caused a total of 9 wounds to the monster, but my opponent promptly saved 7 of them on his 5+ armour save! The return attacks were obviously enough to kill my blades to an elf. The kadim continued its rampage by charging into the corsairs. These fled, hoping to pullthe beast into the ruins right behind them, and cause him to take DTs. As luck would have it, they fled 3” instead of the 4” required, so the Kadim was able to catch them right outside of the ruin terrain feature. The Citadel Guard took some shots at the four remaining blades, killing them all. In my last turn the only thing that remained to do was to move the single Acolyte of Yema close to the Kadim in an attempt to finish it off. In the magic phase, my adversary let the Breath of Corruption go through, then I rolled for GraveCalls and got triple 3s, meaning that my acolyte blew up on his own, denying me the breath weapon. To add insult to injury, the spell failed to even wound the titan, costing me dearly. 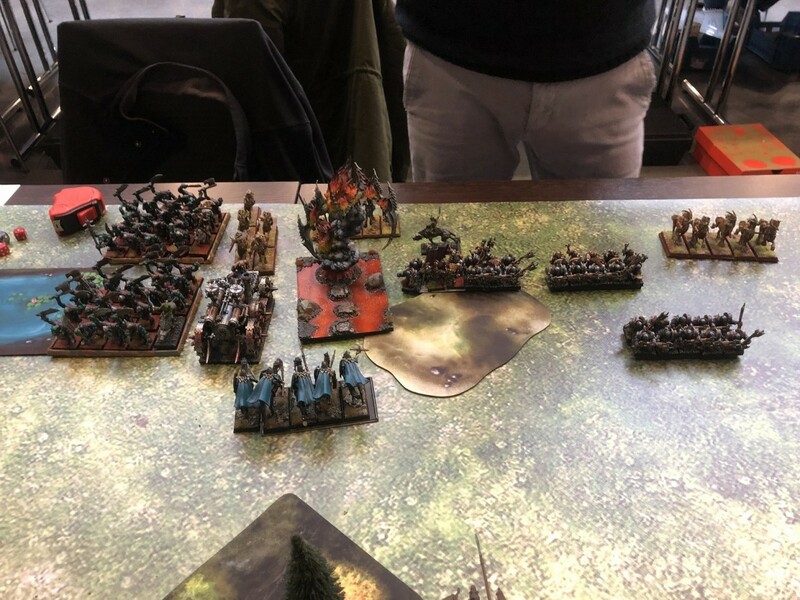 When the dust had settled, I only had a unit of Dark Raiders and a Medusa left, while my opponent had the Kadim Titan and the two small units of citadel guard. When we added it all up, this ended up being an 11-9 victory for the Dread Elves thanks to the secondary objective. What a game! I must say that while at times it was frustrating, this battle was at the same time one of the most enjoyable I have played in a while; Vincent took all his initial bad luck in his stride, and kept fighting back. The double fail in Discipline checks had put him in the back foot and allowed me to get a lot of points. Then on turn 4 all hell broke loose! We discussed it after the game and he felt that my prince pursuing the Prophet was a bad idea. Upon reflection, there were a couple of things that I could have done to ensure that the Prince didn’t find himself in such a bad position: a different alignment of the Prince vs the character unit would have seen him come within 1” of the Kadim during pursuit, forcing him to stop before entering the arc of sight of the Titan.That would have been enough to avoid all this debacle. Even then, I feel that the Kraken charge was inevitable (And killing both with the split attacks is improbable but not impossible) if I had any hope of saving my prince. The following turn was as bad if not worse: I lost my 750 point BSB, a300 point unit of blades and failed to finish off the kadim titan, losing another tournament point in the process. In the end, the rest of the team managed to also get a slight advantage and we ended up winning 55-45 in a very hard fought round! Team Obelix went on to fight four more challenging rounds, and ended up in the third place of the tournament! Congratulations to them, they are great guys and I really hope that we get to see them again at the ETC. Stay tuned for round 2, against team Portugal! Exciting game and great write up! 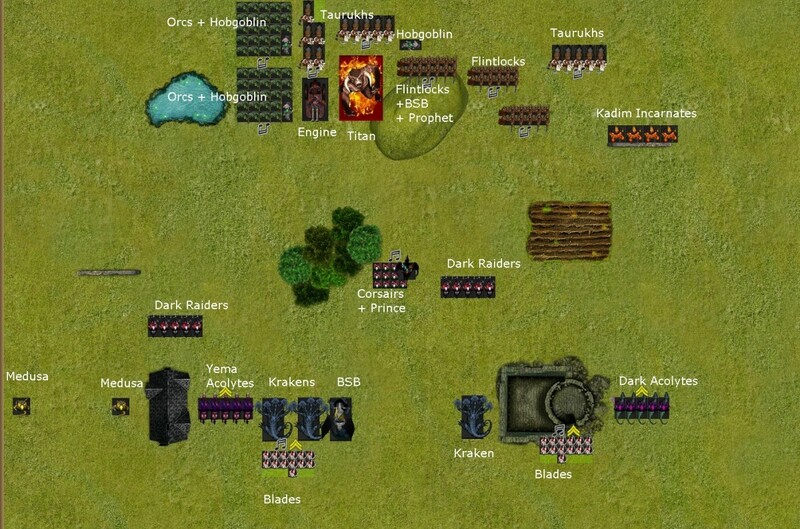 I've heard tales of a game of yours against KoE at the LBM that would be worthy of a battle report! Try it out, it doesn't have to be as long-winded as mine: as long as you have the pics, even legends with brief descriptions would make for an interesting read!